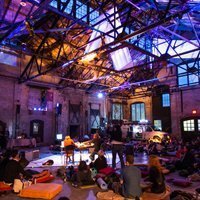 With Basilica SoundScape and 24-HOUR DRONE, the two annual music festivals at the heart of our large-scale rituals, we are proud to welcome revolutionary voices from across the musical spectrum, from sitarists to suspended guitars and gripping political poetry to heart-wrenching neo-gospel. Basilica Hudson and Le Guess Who? 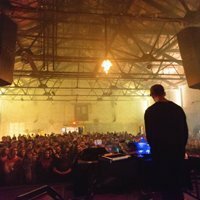 Festival present 24-HOUR DRONE, an immersive, all-encompassing event featuring an international roster of musicians and sound artists working in electronic, psychedelic, classical, non-western, instrumental and other genres incorporating drone to create a full 24 hours of unbroken sound. 24-HOUR DRONE captures Basilica Hudson at its most experimental and experiential, and organizers have also pledged an ongoing commitment to expanding the 24-HOUR DRONE concept via a series of global partnerships and collaborations. International events in Sweden, Canada the UK and the Netherlands allowed 24-HOUR DRONE to reach new devotees of sound, with partners including Winnipeg New Music Festival, FAT OUT and DREAM Music at Malmö Live. Presented in collaboration with The Creative Independent, Basilica SoundScape incorporates live concert performances, conceptual sound performances, author readings, installations, collaborations, curated local vendors, on-site activities and more, creating an immersive weekend of art, music, and culture. 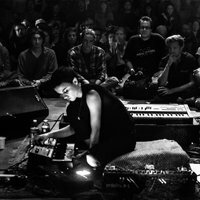 Basilica SoundScape features a lineup of some to the most innovative and genre-pushing musicians, visual artists and writers working today, with unique collaborations across disciplines. 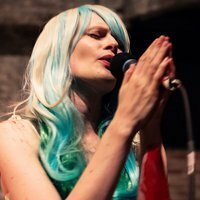 Past talent includes John Maus, Moor Mother, Jlin, Richard Hell, Swans, Gang Gang Dance, Liturgy, Julianna Barwick, HEALTH, Perfume Genius, Pharmakon, Deafheaven, Jenny Hval, The Haxan Cloak, Wolves in the Throne Room, Explosions in the Sky, Genesis Breyer P-Orridge and Amber Tamblyn. Apart from our annual programs, we have also presented special one-off concerts featuring artists such as The National, Grimes, Godspeed You! Black Emperor, Angel Olsen, Light Asylum and Lee Ranaldo (Sonic Youth), Horse Lords, Woods and Black Pus. 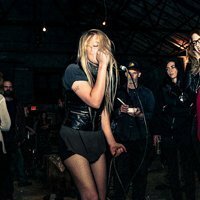 Learn more about our music events. Photo of Vision Control performing during 24-HOUR DRONE: EXPERIMENTS IN SOUND AND MUSIC in April 2015. Photo by Eric Harvey Brown.